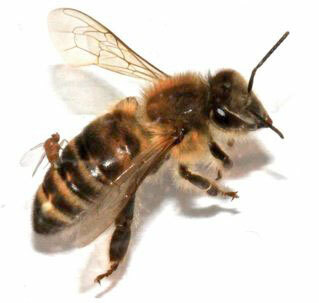 ZomBee: A honey bee that has been parasitized by the “zombie fly,” Apocephalus borealis. The word is a portmanteau of zombie (a reanimated corpse; originally from West African words meaning “fetish” or “god”) and bee. Apocephalus borealis on the dorsal area of a honey bee, laying eggs in its host. Image from PLOS ONE. For more about non-apian zombies, read my word-of-the-week post from January 2009. For another new twist on the zombie trope, read about the Zombie-Eyed Granny Starver, Esquire columnist Charles P. Pierce’s epithet for Republican vice-presidential candidate Paul Ryan.